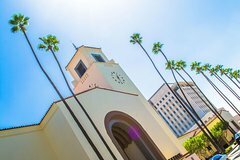 Dive deep into two of Los Angeles’s most historic and flamboyant neighborhoods on this 2-hour Union Station, Olvera Street and Little Tokyo historic walking tour. From the great US railway station to a timeless mochi shop, you’ll discover both popular and little-known treasures in these bustling districts with your friendly local guide. See iconic landmarks like El Pueblo de Los Angeles Historical Monument, La Plaza de Cultura y Artes and indulge your sweet tooth with Japanese traditional delicacies before concluding your tour at the Go For Broke Monument and Japanese American National Museum. 11.00 From there continue to LA Plaza Park, home to world famous el Pueblo de Los Angeles historical monument. This is where Los Angeles officially was founded in 1781. Your next stop is the LA Plaza de Culturas y Artes. Take your time to amble around and explore local life in action. Do not miss prominent Old Plaza Firehouse. Take a look at Pico House, once the most luxury hotel in Southern California, and Chinese American Museum, the most ancient Chinese construction in the area.